As the temperature drops and the furnace starts working overtime, you might notice your skin looking a little more irritated and a little less vibrant. Cold weather, low humidity, and indoor heating can wreck havoc on your skin around this time of year. One of the safest and most effective ways to combat a range of skin conditions is to use all-natural topical treatments that don’t contain harsh chemicals. Winter skin is incredibly sensitive, so the last thing you want to do is irritate it further with abrasive or artificial ingredients. Our OliveViate topical skin relief treatment has proven effective for a variety of skin rashes and irritations, including ones that cause flaking, dryness, burning, scaling, cracking, and inflammation. 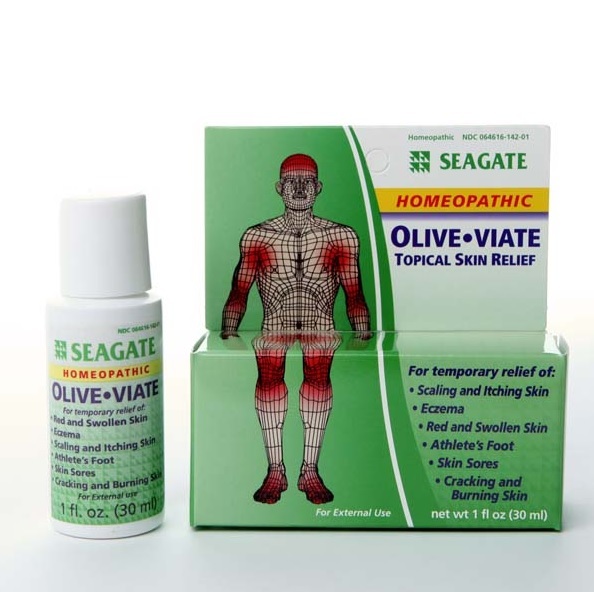 OliveViate can also temporarily relieve the symptoms of eczema and athlete’s foot. This homeopathic medicine is safe to use and 100% chemical-free, so you won’t have to worry about your treatment worsening your symptoms. OliveViate differs from other topical skin treatments because it has a oil base instead of a cream base. The active ingredients are graphites, hepar sulphuris calcareum, rhus toxicodendron, and sulphur. When we developed OliveViate, we looked into several different bases to discover which one delivered these active ingredients to the skin most effectively. Although creams are the most common forms of topical medicine, we found that they take up a lot of space in the packaging and offer no medicinal benefit. So instead, we chose a base of virgin olive oil, natural coconut oil, omega-3 shark liver oil, and natural vitamin E. Unlike cream fillers, each of these ingredients holds valuable medicinal qualities. Since this product is all-natural, it is even safe to use on yours pets’ sores, scratches, and rashes. We love hearing our customers’ stories about success they’ve had using OliveViate on their dogs’ skin when nothing else seemed to work. To reap the benefits of this versatile skin treatment, all you need to do is apply a few drops to your fingertips and work it into the affected area. Always thoroughly wash the area with warm, soapy water before application and fully dry your skin so that it can absorb the healing ingredients. Your skin will completely absorb the OliveViate, and you should apply it again another time or two each day. Most people notice their symptoms improving within one to two weeks of using OliveViate. Although all of the ingredients in treatment are 100% natural, and technically edible, OliveViate is meant to be used for external use only. So no matter how the environment is affecting your skin, OliveViate can help. It’s easier to halt and prevent the worsening of skin symptoms while they are mild and before they become out of control. To be prepared, keep a bottle of OliveViate in your medicine cabinet and feel more confident throughout the winter season.